This well established mixed billing clinic are still experiencing a growth in patient numbers and require a new GP to meet the demand in this popular suburb. This is an established medical practice based in Adelaide. They currently have 6 permanent GPs and are seeing approximately 100 new patients per week, with their current GPs are seeing 4.5 patients per hour and growing by the day. They expect their 6th GP to be fully booked inside of 4 months. The Medical centre is located approximately 24 kilometres north-east of Adelaide CBD. It is a beautiful leafy suburb which has a set of features which makes it a standout in a highly sought out region of Adelaide. The Shopping Centre provides a great retail outlet whilst the nearby Tea Tree Plaza Shopping Centre is one of South Australia's largest shopping centres. There are numerous quality parks, reserves, sporting clubs, medical facilities and schools which cater for the growing population of the area. It is very popular for young families and has great community spirit. Adelaide has what is frequently called a Mediterranean climate with hot summers and cooler winters. South Australia is the direst state in the driest continent in the world so rainfall is less than much of the UK. The seasons in Adelaide run opposite to those in the UK - spring is September to November, summer is December to February, autumn is March to May and winter is June to August. The average temperatures are 15C in winter and 29C in summer for daytime. Adelaide is the capital of the state of South Australia with a population of over 1.1 million people. The city was founded in 1836, is the fifth largest city in Australia and the only capital not founded by convicts. 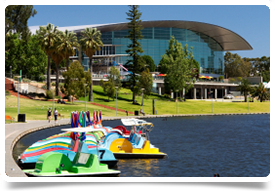 Adelaide is situated between the Mount Lofty Ranges and the Gulf St. Vincent and is divided through the middle by the River Torrens. Adelaide is noted for its many festivals and sporting events, its food, wine and culture, its long beachfront, and its large defence and manufacturing sectors. It continues to rank highly as a liveable city, being in the Top 10 in The Economist's World's Most Liveable Cities index.